After I had jumped over the railing, I had Niki reach into my bag and grab my cloth medical tape. Ben helped tape the palm of my hand and the lower part of my pointer, middle and ring fingers. This actually turned out to be a great idea since the rope ended up going right over my pointer finger. After my hand was all taped up, I managed pretty much pull the same stunt Peter did in lowering himself. 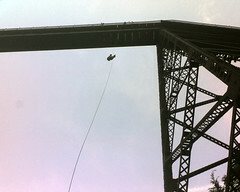 However, instead of doing the rope wrapped around the leg trick, I stood on the flange from the I-beam below the bridge and adjusted myself (…although not in that way). And with that, I was off. 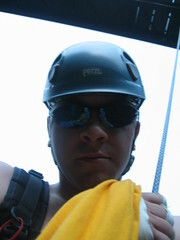 The funny thing about rappelling is how I viewed possible points of failure. Initially, I was concerned mostly about the mechanical systems that we installed and used (i.e. the railing, ropes, knots, and carabiners), however I very quickly realized that I was the weakest link! That is, for lack of a better word, a very sucky thing to realize halfway down and I would by lying if I didn’t say that I had some doubts about my ability to make it down.